CW3E hosted the annual California Department of Water Resources Winter Outlook Workshop (WOW) from Nov. 1-3, at Scripps Institution of Oceanography. The purpose of the workshop is to highlight the latest science in seasonal to subseasonal (S2S), 1-month to 3-month, atmospheric forecasting. This timescale bridges the gap between weather and climate prediction. The meeting was organized by Jeanine Jones, ‎Interstate Resources Manager, and covered a variety of topics including paleoclimate, week three predictions, atmospheric rivers (ARs), summer North American monsoon, new forecasting tools, and drought. During the first day, Dave Meko, from University of Arizona, discussed paleodrought in Southern California and how this compared to paleodrought in Northern California and in the Colorado River Basin. The second day of the workshop highlighted recent accomplishments in subseasonal to seasonal forecasting. Dr. David DeWitt, NCEP CPC Director, presented on the S2S activities on-going at the National Weather Service (NWS) Climate Prediction Center (CPC). Dr. Marty Ralph, Director of CW3E, gave an overview of the activities at CW3E related to observations, modeling and S2S prediction ARs. This was followed by a session chaired by Dr. Duane Waliser and Dr. Aneesh Subramanian on current S2S activities at CW3E and an experimental CW3E week-3 AR outlook product. The session had three talks presented by Dr. Alexander Gershunov, Dr. Michael DeFlorio, and Dr. Aneesh Subramanian on the experimental CW3E week-3 AR outlooks and the multi-pronged effort to design and evaluate the product. The day ended with presentation by Yolande Serra, from the University of Washington, on the dynamics and predictability of the summer monsoon. The third and final day began with a presentation on the influence of ARs in the Colorado River Basin as well an historical perspective on atmospheric river maps by Jon Rutz, National Weather Service. The last presentation of the day was by Dan Cayan on how various atmospheric patterns can lead to drought in the western U.S. WOW provided an opportunity for CW3E researchers and collaborators to share their latest advancements in subseasonal to seasonal forecasting and discuss future research collaboration and needs. 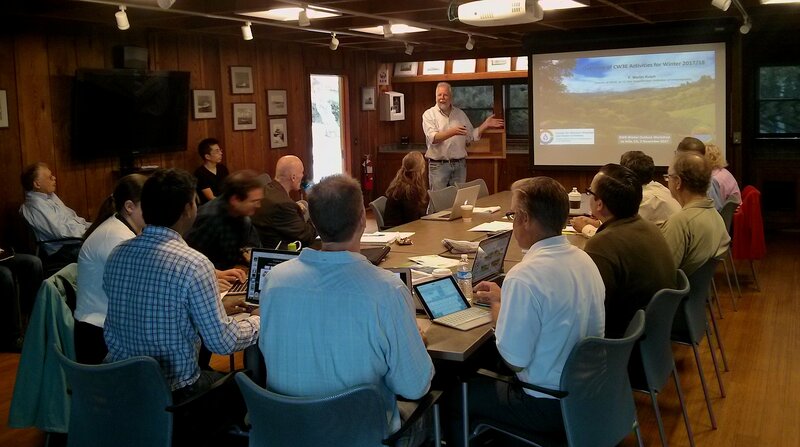 CW3E Director, Marty Ralph, discusses the research and activities at CW3E during the DWR WOW. During the workshop Jeanine Jones also presented Department of Water Resources Climate Service Awards to Dr. Jason Cordeira, Plymouth State University, Dr. Duane Waliser, NASA JPL and Dr. Dave Meko, University of Arizona. The awards highlight the three individuals’ contribution to climate science as it applies to DWR operations. Jason Cordiera, a close collaborator of CW3E spoke of the honor, “My collaboration with CW3E has led to the synergistic development of many weather forecast tools that have benefited and informed water resource management and related impact-based decision support. Receipt of the CA DWR Climate Science Service Award reflects the dedication of many individuals at CW3E and Plymouth State who support and provide invaluable resources to maintain a productive research and application environment. Thank you to the CA DWR for the honor and I look forward to continued collaboration in pursuit of improving our ability to understand and forecast hydrological extremes”. Recipients of the Department of Water Resources Climate Service Awards, presented at the WOW. From left, Dr. Duane Waliser, NASA JPL, Dr. Dave Meko, University of Arizona, and Dr. Jason Cordeira, Plymouth State University.